The unknown is inherently unpredictable. Wind tunnels, simulators and computers can only model what is known. That became clear by the mid-1940s as engineers began to probe the technological challenges of piloted, supersonic flight. By early 1945 the world's first experimental airplanes were under development: the rocket-powered XS-1 (later designated X-1), built under Army sponsorship by Bell Aircraft, and the turbojet-powered D-558-1 constructed by Douglas Aircraft under Navy patronage. With the supersonic X-1, flight testing assumed a distinctive process using highly experimental research programs -- such as with the X-3, X-4, X-5, and through dozens of subsequent X-series aircraft. Research aircraft are the tools for exploration and discovery. Each is instrumented to acquire data about the aircraft, its systems and even the surrounding environment during research flights. These are typically flown by the Air Force in conjunction with NASA and conducted in a very methodical fashion to answer largely theoretical questions concerning innovative aircraft design principles. The X-15 explored hypersonic and exoatmospheric flight. Indeed, within an eight-month span in 1961, it became the first aircraft to exceed Mach 4, -5, and -6, and it later went on to become the first--and, so far, only--airplane to fly in near space as it soared to a peak altitude of more than 67 miles (354,200 feet). Until the 1970s, experimental planes (designated "X"-planes for "experimental") were the chief research tools for flight regimes that wind tunnels, simulators and production aircraft could not approach. The X-Plane Program has evolved from being the first rocket-powered airplane to break the sound barrier (the X-1 on 14 October 1947) and included over 30 different major research designs, although not all were developed into flying prototypes . As the program progressed, other non-rocket-powered experimental aircraft were built and tested. These aircraft included: a range of vertical takeoff and horizontal landing vehicles; smaller, propeller-driven reconnaissance vehicles; and a series of unmanned missile testbeds of both single and multistage designs. Although the program grew to include conventional propeller-driven aircraft, all designs had in common the aspect of being highly valuable research tools for advancement of aerodynamics and astronautics. Accomplishments of the X-Plane family have been many. The program included: (1) the first aircraft to break the sound barrier; (2) the first aircraft to use a variable-sweep-wing in flight; (3) the first to fly at altitudes in excess of 30,000, 60,000, and 90,000 m (100,000, 200,000 and 300,000Êft); (4) the first to use exotic alloy metals for primary structure; (5) the first to test gimbaled jet and rocket engines; (6) the first to use jet-thrust for launch and landing; (7) the first to fly three, four, five, and six times the speed of sound; (8) the first to test boundary-layer-airflow control theories over an entire wing at transonic speeds; (9) the first to successfully complete a 180-degree turn using a post-stall maneuver; and (10) the first missile to reach an intercontinental flight range. Another member of the X-Plane Program would be the X-33. As a reusable spaceplane, the X-33 continues the research line developed by various components of the X-Program, such as the X-10 which tested cruise missile components; the X-12, the Atlas B missile which tested one-and-one-half propulsion staging and obtained the first intercontinental flight distance for a US missile; the X-15 which explored the problems of space and reentry at high speeds (Mach 6) and altitudes; the X-17 which explored high Mach effects on reentry vehicles; and the X-23A which was the first maneuvering lifting reentry vehicle. The X-17 was a multistage rocket design which transported various reentry vehicle configurations to very high altitudes to examine their reentry characteristics. The X-23A was launched by a modified intercontinental ballistic missile and utilized a "lifting body" design to glide back to earth. Information acquired from the X-23A was instrumental in later development of the Space Shuttle. The majority of testing for the X-Plane family has occurred at Edwards Air Force Base (formerly known as Muroc Army Airfield). Hosts within Edwards include the Air Force Flight Test Center and Dryden Flight Research Center. Other sites which have served as X-Plane testing sites include: Langley Research Center and Ames Research Center; various Government owned ships; White Sands Missile Range, New Mexico; Wright-Patterson Air Force Base, Ohio; Cape Canaveral Air Station, Florida; Pinecastle Air Force Base, Florida; Buffalo, New York; and the National Aviation Facilities Experimental Center in Atlantic City, New Jersey. Edwards has seen more X-Plane programs and test flights than any other similar facility in the US. As with every research program testing prototype equipment, the X-Plane Program has not been without technical glitches and equipment failures. Since the beginning of the program's manned flight operations in 1946, approximately 15 major accidents and 4 fatalities (pilots) have been associated with manned vehicle tests. Three of these fatalities were from the X-2 Program, flown between 1952 and 1956, and the remaining fatality happened in 1967 during an X-15 research flight. Stringent range safety controls have resulted in no civilian property damage losses or fatalities being reported as a result of any X-Plane Program accident. Given the overwhelming number of test flights, the small number of accidents which resulted in loss of aircraft or life can be considered a remarkable program achievement. 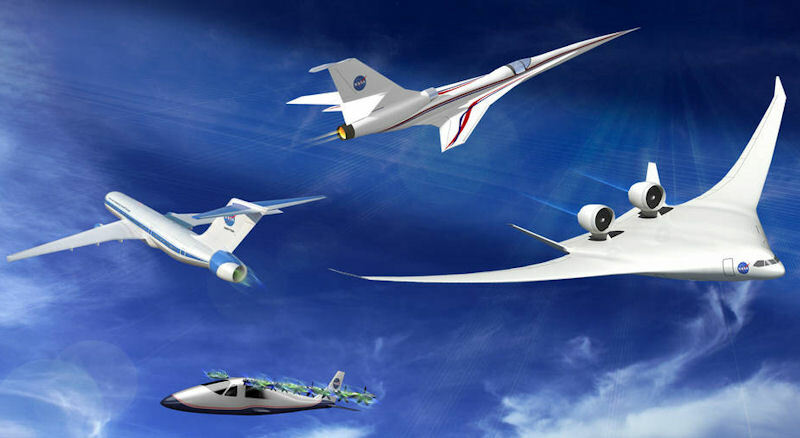 In 2016 NASA had a 10-year plan - New Aviation Horizons – an ambitious undertaking by NASA to design, build and fly a variety of “X-plane” flight demonstration vehicles. Thanks to results coming out of six years of technology demonstrations done with other government agencies, industry and academia, NASA Aeronautics felt confident to enter X-plane territory. One of the first X-planes is expected to be a hybrid wing body shape, where the familiar tube-and-wing instead becomes a wing that blends into the body. It flies the same speeds as commercial transport aircraft. Engines are on top of a fuselage that is itself revolutionary because of the shape and what’s required to build it to withstand the stresses of flight. One X-plane will demonstrate specific technologies related to ultra-efficient subsonic aircraft designs in flight – possibilities include very long but narrow wings, forms of electric propulsion, a double-wide fuselage, or engines embedded into the vehicle. One X-plane will be a business-jet-sized supersonic vehicle that burns low carbon bio-fuels and generates such quiet sonic booms that people on the ground will barely hear them. The New Aviation Horizons X-planes will typically be about half-scale of a production aircraft, although some may be smaller or larger, and are likely to be piloted. Design-and-build will take several years, with vehicles going to flight starting around 2020 depending on funding. The 10-year plan also includes major field tests in collaboration with airlines, airports and the Federal Aviation Administration to continue improving air traffic flow in the air and on the ground at airports. Improving the flow leads to reduced fuel use and emissions, and less noise during takeoff, approach and landing. And NASA will continue researching and testing technologies that could be used to safely integrate unmanned aircraft systems, or drones, into the airspace.